Ever since I begin my university studies in 2009, a concern arose in me; it derived from the frustration generated from taking courses related to the border. At first these classes focused on the feminicides–the murder and disappearance of hundreds of young women working at the factories (maquiladoras)–NAFTA (North American Free Trade Agreement), the aftermath of the war against drug trafficking as well as other issues tied to the US-Mexico border (immigration, militarization, violence and more violence). Most of these classes have been very difficult for me because of the negative perspective perpetrated to this geographical space and its communities. Despite the reality of these problems, interpreted in a particular way in these contexts, these classes were framed from a number of generalizations, without going deep into the history that lies behind the continuous crises. Being a border woman, born and raised in the same place where my parents met while working in the Toshiba factory, my life has always been centered in a transnational environment. Therefore, the abuses, the violence and everything that implies living under a mechanism controlled by the hegemonic interests of an imperialist and capitalist system have been part of my everyday life. So, when I talk about my hometown (la frontera #1), most of the time I feel very sad and frustrated because my birthplace ends up being the representation of the chaotic, the dangerous, and the monstrous zone. It produces a rejection of the border or, in many cases, it provokes a feeling of a division to draw a distinction between the United States and Mexico. By living in this region one perceives and, in one way or another, resists that the problems that emerge, concentrate or impose themselves in this place, are beyond the sensationalist or tragic story and are there for paternalistic reasons. 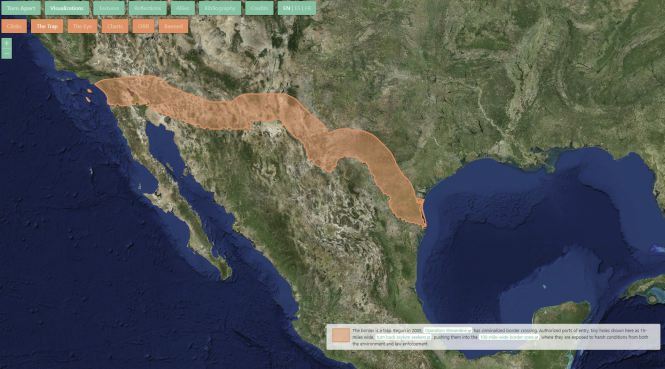 Also, the same mechanisms that control spaces like the US-Mexico border or the Central America region itself have been responsible for building “the official history” of these spaces and perpetuate the omission, invisibility, and alteration of the voices of the communities that inhabit these places. This content was selected for Digital Humanities Now by Editor-in-Chief Laura Crossley based on nominations by Editors-at-Large: Joseph Garvin, Marija Semjonova, Natalie Ornat, Seyithan Ozer.